The black-eyed kids. For some may be nothing more than an urban myth but for those who have had encounters with them, they are very real. One of the first encounters of the black-eyed kids were that of Brian Bethell. In 1996 journalist Brian Bethell was sat in his car attending to some errands. When he noticed from the corner of his eye two kids stood at the side of his car. Brian rolled down his window but when he did an unmistakable feeling of dread washed over him. The boys removed their hoods, and the one as bethel described as having brown curly hair spoke and asked him if they could have a lift home. The boy said that they were wanting to see a movie but had left their money at home and wanted a lift, so they could get their money and go and watch the movie. Bethell refused, and the boys began to insist and stressed that fact that they were just two young boys and nothing bad would happen. At this point Bethell reached for the lock. At this point Bethell noticed for the first time that the boys had eyes as dark as coal! No Pupil, no iris, just darkness! At this point Bethell revved his car and sped off, away from the boys. This isn’t the only account of black eyed kids and all accounts of them are always described as being the same. The kids will ask for a lift or for entry into your home and it appears they require your permission to enter and that they can’t enter without it. All cases where the black-eyed kids have received permission to enter have never ended well, and often the people that have given permission will become ill for no apparent reason. There have been cases where people who have been the picture of health have had an encounter with the black-eyed kids and suddenly been diagnosed with incurable illnesses! 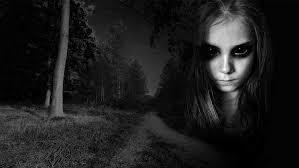 The black-eyed kids never seem to hurt their victims directly, but they do affect their health. It is said that if you ever meet a black-eyed child you should never, under no circumstances give it permission to enter your car or property! Previous post: Paranormal Community Mocks Woman Who Claims To Sleep With Ghosts…. Is there Answers?